LegalTech New York 2015 is history, and, if you’re like me, you probably needed this week to recover. Below is my top 10 list of memorable moments in New York City last week, in case you missed it. 10: The cold never bothers us, anyway. For the second year in the row, the east coast was blanketed in snow, ice and sleet the week of LTNY. But just like last year, the weather did not put a damper on the event – attendance was stellar – despite some pretty horrid travel delays. 9: Missing Browning: Make no mistake about it, one formidable LTNY giant was missing this year. The conference was just not the same without Browning Marean. 8: The Changing of the Guard. The big story at LTNY was the retirement of Monica Bay, LTN editor. Monica’s 30+ years of covering legal technology news offered a well-deserved reason to turn LTNY15 into a giant going-away party. 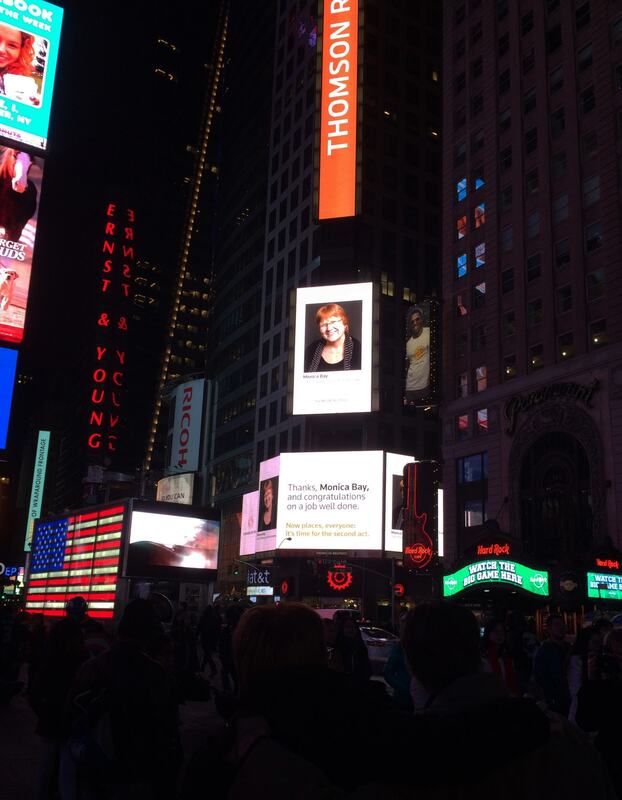 From her picture in Times Square to a tribute rock-concert, it was nice to toast Monica’s accomplishments. 7: New Name, New Editor. With Monica’s departure, American Law Media took the opportunity to announce a new name and new editor for its flagship brand. LTNY was a perfect opportunity to showcase Erin Harrison and Legaltech News. 6: Expanded Exhibit Hall. In addition to all the usual players, the exhibit hall was filled with up-and-coming legal technology start-ups. This year LTNY partnered with CodeX (The Stanford Center for Legal Informatics) to bring new legal technology applications to the conference. 5: Swag. Everyone loves a good give-away! From prize wheels to ducks and shoe shines, no one walked away empty handed. 4: Hot Parties! As tradition, the first night of LTNY kicked-off with a welcome reception hosted by Kroll Ontrack. It was a pleasure to grab a drink, enjoy some swinging music and catch-up with old friends. For after-hours socializing, the young-at-heart made sure to get their kCura Relativity wrist-bands to secure their admission into the late night LTNY extravaganzas. 3: Killer Keynotes. Top-notch speakers with interesting commentary: cyber security, privacy, innovation, international corruption and more! 2: IG and PC. Information governance and predictive coding dominated the educational tracks once again this year. 1: A True Tech-a-Thon. Above all, the chief reason to come to LTNY is to vet prospective solutions and look for new legal tech ideas. From early morning breakfast meetings to vendor announcements, this year did not disappoint. Case Law: CBT Flint Partners, LLC v. Return Path, Inc.